Contrary to the famous characters he portrayed, Bogart came from an upper middle class background. He was born on December 25, 1899 in New York City. His father, Humphrey DeForest Bogart, was a well-known surgeon and his mother, Maud Humphrey, was a reputable artist and illustrator. Having ample financial means, the Bogarts wanted only the best for young Humphrey. His education was in the finest east coast institutions such as Trinity School and the Phillip’s Academy in Andover, Maryland. In school he prepared to study medicine, but Humphrey’s grades were not spectacular. An incident with a faculty member at Phillips, and his bad grades, got Bogart kicked out of school and enrolled in the Navy. Bogart’s enlistment in the U.S. Navy led to the trademark scar that he flashes in his movies. Just how he obtained the scar is not certain, but there are two probable stories. One story claims that a piece of shrapnel struck him while he was serving on the USS Leviathan. The other story claims that he received the scar from a fight with a prisoner he was escorting. According to the story, the prisoner asked for a light for his cigarette, and while Bogart was getting out his lighter, the prisoner struck him in the face with his handcuffs and tried to run. Bogart then got up and shot the prisoner as he tried to flee. Either way, the Navy gave Bogart a trademark that became part of every tough guy he portrayed. Once he was released from the Navy, Bogart went to work as a clerk for on old family friend named William Brady. Brady’s daughter, actress Alice Brady, thought Bogart may be a good actor and got him into theatre, but the reviews he received were not stellar. 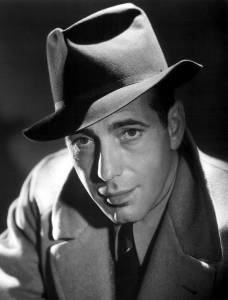 Though the critics were harsh on him, Bogart continued to find steady work in the theatre, and was able to make a living. While doing live theatre, he met Helen Menken, a reputed stage actress. Menken was attracted to Bogart and Bogart was entranced with Menken’s success. Soon the two were married, though love was not really a part of their relationship. After only a year they were quickly divorced. Bogart then married another theatre actress named Mary Phillips. At the time, Bogart was trying to breathe new life in his stale theatre career, and he decided that he needed to move to Hollywood and try movies. Mary wanted to stay in New York and continue her acting career. A long distance relationship developed as Humphrey tried to make his way into films and Mary became the breadwinner with her theatre career. Bogart eventually moved to Hollywood full time with Mary. But she did not want to give up her New York theatre career, and after being in Hollywood only a few months, Mary moved back to New York and the marriage was over. The first move to Hollywood, career wise, was not sensational for Bogart. The first few movies he made were box office busts, forcing him to bounce around between the major film companies pursuing work. In the movies, he mostly played immature young men and romantic interests. But after years of playing the same roles, he was losing his youthful looks, and he could no longer pass for the young men he portrayed. He returned to New York to try to find a way to restart his career. He soon found a role as the maniacal killer Duke Mantee in the play “The Petrified Forest.” For the audition, Bogart did not shave for days and wore raggedy clothes so he would look the part. The play soon turned into a movie and Bogart was cast to be Mantee in the film version as well. The movie landed him a contract with Jack Warner and Warner Bros. Studio, and he was on his way, or so he thought. The first move to Hollywood, career wise, was not sensational for Bogart. The first few movies he made were box office busts, forcing him to bounce around between the major film companies pursuing work. In the movies, he mostly played immature young men and romantic interests. But after years of playing the same roles, he was losing his youthful looks, and he could no longer pass for the young men he portrayed. He returned to New York to try to find a way to restart his career. He soon found a role as the maniacal killer Duke Mantee in the play “The Petrified Forest.” For the audition, Bogart did not shave for days and wore raggedy clothes so he would look the part. The play soon turned into a movie and Bogart was cast to be Mantee in the film version as well. The movie landed him a contract with Jack Warner and Warner Bros. Studio, and he was on his way, or so he thought. Although the movie was a huge hit, Warner was not interested in making Bogart his next big star. Warner already had names like James Cagney in his stable, so Bogart was left to star in many forgettable films. At this time Bogart was able to make a few good movies when he was loaned to other studios, but he would return to Warner to be stuck with more forgettable roles. His personal life was not as successful as his onscreen career. After divorcing Mary Phillips, Bogart met Mayo Methot on the set of the movie “Marked Woman.” Methot was an alcoholic with a very bad temper. But in spite of this, a marriage followed, a rocky one, to say the least. Numerous are the stories of the public arguments and fights they had. It was not uncommon for them to slap, hit, punch, and even throw things at each other. Methot, who was very jealous, would follow Bogart on movie shoots and constantly accuse him of cheating on her with other actresses. Bogart, who had previously liked to drink, really began to hit the bottle as his horrendous marriage dragged on. It was during the filming of “To Have and Have Not” that Bogart met Lauren Bacall. He was immediately smitten with her, and the two fell in love. Methot tried to hold on to her husband, but she eventually saw it was fruitless and, in 1945, divorced him. Bogart and Bacall were married 11 days after his divorce and lived as a happy couple until Bogart passed away.